The men's 100-meter dash is likely the most important event of the entire Rio Olympics when you consider its historical significance. Jamaica's Usain Bolt, who took home gold in both the 100 and 200 meters at the previous two Summer Games, will try for an unprecedented third straight gold medal in the 100 meters when preliminaries begin Saturday. Oddsmakers have installed Bolt as a considerable favorite to pull off the historic 100-meter triple, which would surpass the consecutive gold medals won by Carl Lewis in 1984 and 1988. It's certainly understandable given he's the fastest man to ever walk the earth. But the 2016 Summer Games will be no walkover for the long-striding flash. There field for this Olympics contains three other serious contenders: Bolt's countrymen, Yohan Blake; and Justin Gatlin and Trayvon Bromell, both of the United States. The money has been coming in on Bolt, as earlier this week the line had been as low as -200. Gatlin, Blake and Brommell have all held steady. Let's take a closer look at the four main contenders. Usain Bolt (-225) The world-record holder and six-time Olympic gold medalist seemed in a bit of trouble when forced to miss the Jamaica Olympic Trials because of a hamstring tear earlier this summer. It seems no longer a concern. Bolt signaled his readiness three weeks ago with a daylight victory in the 200 meters at the Mullen Anniversary Games in 19.89. As is always the case when it comes to the greatest sprinter ever, it's his race to lose. The 34-year-old Gatlin, who won gold at Athens 2004, would become the oldest winner of this event. Despite the advanced age, Gatlin is running as good as ever. In last month's U.S. Olympic Trials, his winning time of 9.80 was the fastest 100 meters clocked in the world this year. Gatlin has also been right on the heels of Bolt in recent competitions. In last year's World Championships in Beijing, Gatlin finished just .01 seconds behind Bolt to take the silver medal. Gatlin has certainly had a checkered career with two separate doping bans, but that also means there's less mileage on those legs. If Gatlin's ever to beat his nemesis, this could be the time. Brommell is the new face of American sprinting. Just 21-years-old, Brommell finished third behind Bolt and Gatlin at last year's World Championships while a member of the Baylor track team. He's only gotten better since then. At last month's U.S. Olympic Trials, Brommell clocked a personal-best 9.84 seconds. A similar performance puts him in contention for the medal stand, a step forward and he shocks the world. Blake's negative is he's missed significant time the past two years because of a string of injuries. The positive is that he appears back in form as he won this event at last month's Jamaican Olympic Trials. Yes, the absence of Bolt certainly made the task easier. But don't overlook Blake's personal best of 9.69 seconds. When healthy, this guy can still run with the best in the world. 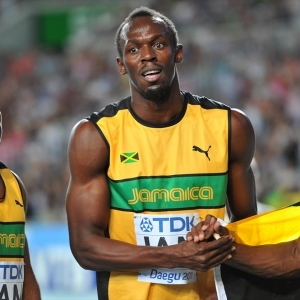 Pick: Bolt will be the dominant storyline the second week of the Rio Olympics. Not only is he going for a three-peat in the 100 meters, he's also seeking gold medal triples in both the 200 meters and 4x100 meter relay. Such an accomplishment would be of epic proportions. But for bettors, laying -220 in this race doesn't offer much value. There are some legitimate threats to Bolt. Perhaps this becomes the coming-out party for Brommell. His third in last year's World Championships was a great introduction to the international scene, and reports are he's continued to move forward. It would be a monster upset, but let's take a shot with Brommell at +1400.